Implantech FEP Fluoropolymer Films are melt adhesives for heat bonding or laminating materials that have high temperature stability. 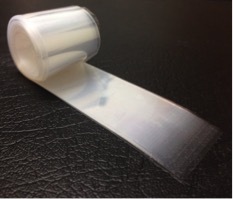 The FEP films can be used in conjunction with all of Implantech’s fluoropolymer products. The films are available in 0.5 mil, 1 mil and 2 mil gauges. Implantech FEP films have been qualified for permanent implant applications in accordance with ISO 10993:2003. 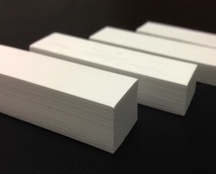 Implantech Non Reinforced ePTFE Sheets are soft and flexible sheets of PTFE with a controlled porous microstructure. Eptfe for Implant sheets are manufactured in an USFDA-approved medical device manufacturing facility with the highest standards of purity. Tightly controlled process specifications and lot testing ensure that each and every product conforms to specification.Eptfe for Implant materials have been qualified for permanent implant applications in accordance with ISO 10993:2003. Implantech Reinforced ePTFE Blocks are laminated blocks of FEP and ePTFE fluoropolymers. 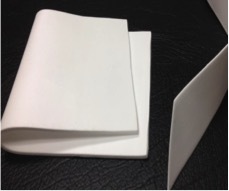 The outer layers of the laminate are expanded PTFE with a controlled porous microstructure. The Reinforced ePTFE Blocks are manufactured in an USFDA-approved medical device manufacturing facility with the highest standards of purity. Tightly controlled process specifications and lot testing ensure that each and every product conforms to specification. Implantech ePTFE materials have been qualified for permanent implant applications in accordance with ISO 10993:2003.